Hair removal is probably the biggest ‘chore’ in a girls beauty regime – well, it is for me. It’s not fun, it’s not glamorous but it really is a necessity. Gone are the days when I was fine with a cheapy disposable razor will do for a quick legs & put de-fuzz. I’ve now taken to using a whole array of hair removal methods (plucking or threading, shaving, epilating AND waxing). SO when potentially facing a way to permanently remove just one of these from the beauty ‘things to do’ list, I’m pretty excited. In case you hadn’t guessed from the title – I’m talking about testing the latest Boots Smooth Skin Plus. 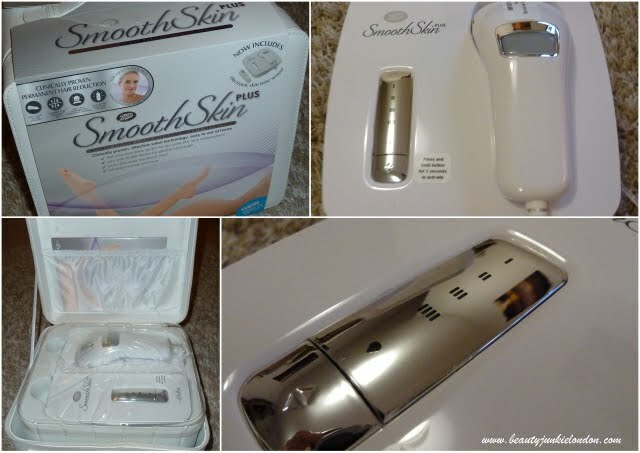 Smooth Skin Plus is an at-home IPL (intense pulsed light) machine, designed to permanently stop hair growth after around 12 weeks of sessions. A maximum of one session a week, this is along term commitment to hair removal. I’m not a technical expert, but as I understand it the machine basically flashes a pulse of high intensity light that penetrates the hair follicle and kills the hair at the root. Stopping it from growing, or at very least wounding it a bit so it grows back slower and lighter than before. 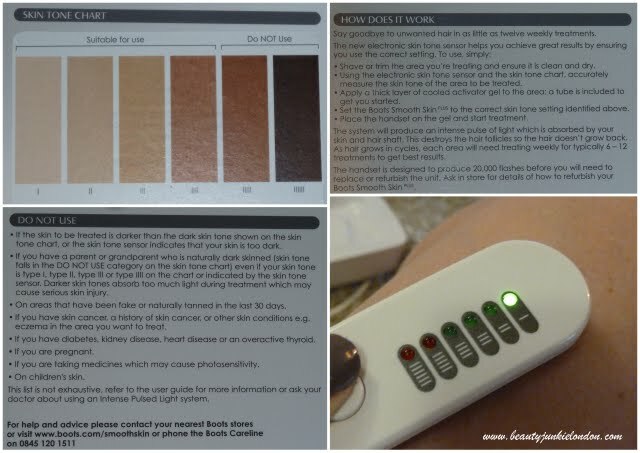 The kit is designed to work on paler skin tones (score) and comes with a skin tone sensor so you can check what setting to place the machine on. I’ve actually had this kit for a few weeks but have been a bit of a chicken about using it – I kept putting it off as I was a bit worried it was going to really hurt. But I was wrong, when I eventually plucked up the courage I found it was absolutely fine – it felt a little like snapping an elastic band against the skin at the very worst but generally was totally painless, just a flash of warmth. Click on the picture to enlarge and read the text. I will report back in around 6 weeks on how the results are going, and again at 12 weeks. Of course permanent hair removal doesn’t come cheap, the Boots Smooth Skin Plus costs £349.99 (£50 off at the moment) but at around £35 for a bikini wax that’s just 10 treatments. So if it works, this thing will have paid for itself in a year. It didn’t take long at all – in fact, I’m meant to do it on Sundays, but forgot so did it whilst getting ready for work this morning. So very speedy, if I was doing legs though would take much longer! Does the kit come with protective eyewear? Is eyewear recommended in the instructions? how can I buy boots hair removal?